Hello My Pink Friends and welcome to the October Pinkalicious blog hop! If you are hopping over from Robyn's @ My Pink Stamper, then your are in the right place! If you are just stopping by for a visit and would like to hop along, go to My Pink Stamper to start at the beginning so you don't miss any of the fabulous inspiration we have in store for you today! For today's hop, we created goodie bags! With Halloween right around the corner, and Boo Buddies coming up soon at work, I thought this would be the perfect opportunity to get out the sewing machine. I am totally new to sewing, as this is only my 2nd time even getting out my new toy, but it so exciting seeing the finished product! 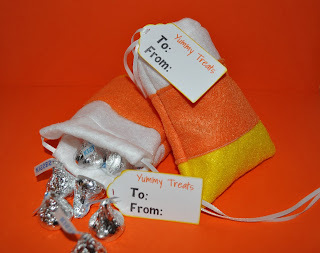 This could get addicting LOL....speaking of addictions, I found a great tutorial for these cute, little candy corn style treat bags on Pinterest (if you haven't discovered Pinterest, run, don't walk and get to pinning :)). If you'd like to give it a try, you can find the tutorial HERE (I think I spent under .60 cents for enough felt to make 4 or 5). For the gift tags, I used Cricut cartridge Tags, Bags, Boxes & More, and My Pink Stamper's Yummy-licous and Spook-alicous stamp sets. Roberta <---- You are here! These are so cute--what a great idea! Awww, these are sooo super cute!! Love these and make the perfect fun Halloween theme goodie bags!! Wonderful! Makes me want to go right out and buy some candy corn even though we have no trick or treaters here...yummy!!! What a awesome idea! Very cute! love the bags, they turned out cute! Aw! I love these little bags! So cute! Cute and oh so simple! very cute!! Good detective work! They are darling!!! These bags are super cute. Great job for being your second time with the sewing machine! Adorable bags, perfect colors for Halloween! This is such a cute idea! I love the candy corn bag! Cute bags, candy corn is one of my favorites. So very cute. Anyone who gets one will love it to pieces.!! Sweet treat bags, such a cute idea. Love Pinterest too. What a cute idea! Love the candy corn colors! So fun! I love these treat bags! They are so cute! Super cute idea! I love them! This is so cute! I love all things candy corn! Such a fun idea. Super adorable! I can't believe you just learned to sew... you did an amazing job! I can't sew straight to save my life! LOL! Cute little bags for holding some treats. You did a nice job!--Pat N.
I LOVE the candy corn bags. I may have to do that for the Halloween party we're having. What a FUN idea! Cute treat bags. My husband really likes candy corn. I think this would make a great party favor for Thanksgiving too. TFS. OMG! These are darling...I wish I had just an ounce of your talent! Roberta, this little bag is super sweet! I love the cute little felt goodie bags. I wish I could sew. You bags are so cute! These bags are too cute! Thanks! so cute love the candy corn bags!! ADORABLE!!! I wish I could sew!! LOL Super job! Those are the cutest bags! Can't wait to try them (one day :). The candy corn bags are so fun looking. Super cute! Your are becoming a sewing DIVA! I AM TOTALLY MAKING THESE!!!!! SO SEW SEW SOOOO CUTE!!!! I love candy corn and just love this idea! TFS! This is a very fun idea, I love the candy corn colors! Am loving your inspiring ideas! Will get felt and make these bags, for sure! So adorable!! What cute little corn candy bags! Love this candy corn pull string bag! So cute, especially the fabric you chose. Thank you for sharing.